In addition to having published science fiction novels and books on rocketry, Michael A. Banks is the author of DELPHI: The Official Guide and The Modem Reference—both from Brady Books/Simon & Schuster. I recently noticed yet another of science fiction's stock concepts becoming a reality—something that seems to be happening more and more nowadays. The concept is this: all the world's knowledge neatly packaged and ready for instant access. Tap a few keys to tell a computer what you want to know, and voila, the facts you need, complete with cross-references, are displayed on a screen or printed out. No bothering with library card catalogs and books. No loading a mere half-megabyte database. No dialing up an online service (science fiction heroes would never put up with "Your request has been entered; one moment please" and the ensuing ten-minute wait). And, best of all, it's accessible to the typical "person on the street" of average means and knowledge. The two-edged nature of this metaphorical sword of information is the focus of discussion here—that, and something I've labeled the "Ultimate Temptation." But before I get into that, let's take a closer look at what's happening with CD ROMs, namely personal computers. CD ROMs have already carved out their niche in the personal computing ecology. There are few personal computers for which CD ROMs aren't made or planned. Potential CD ROM consumers, already conditioned to accept the odd-size disks by audio CDs, are now being educated, through advertisements and articles and books, on the glories of CD ROM. Couple such awesome storage capacity with high-speed text search capability, and you have a computing tool that is rivaled only by the resources of online services such as Dialog. But it's not much of a rivalry: CD ROM access is not subject to being slowed down by packet switching networks and modems and the problems of serial data transfer. (And remember that the quantity of CD ROM data is not limited to one disk. Swapping CD ROMs is faster than moving from one database to another.) Then there's the fact that, if you make use of the data on a CD ROM with any frequency, the cost, when compared with accessing an online information service, is more than attractive. And, to ice the cake, CD ROMs are far more durable than standard floppy or hard disks. The disks themselves are priced on a "value added" basis, according to the information they contain. Want an encyclopedia at your instant on-screen beck and call? Figure on shelling out $395 for Grolier's Electronic Encyclopedia (the same one you find on DELPHI and other services), and additional cash for updates. (The price is actually comparable to what you'd pay for the bound books themselves, though.) The ticket for the American Heritage Dictionary, Roget's Thesaurus, Bartlett's Familiar Quotations and The U.S. Zip Code Directory on one CD ROM disk is $295. There are some 500 specialized and general CD ROM "data products" currently available—and there will be more, many more. Even Dialog has put some of its content on CD ROM! But don't let the prices for hardware or disks scare you. As you've probably already figured out, costs will drop as demand increases. They're already selling these things in Sears Business Centers, which implies a lot. Knowledge is power, and when the costs bottom out (give it five years) ROMs will be putting power in the hands of a lot of people. Thus the information revolution approaches maturity. As I implied earlier, it hasn't been long since this kind of information-retrieval capability was little more than a background concept used in science fiction novels and short stories. 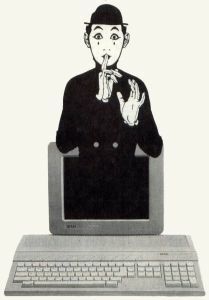 Then, in the late 1970s, it edged into the fringes of mass reality via personal computers, modems and online information services that one of average means could afford. Certainly, network-accessible databases existed before the late 1970s, but only a privileged few could access them. Now, total and ultimately convenient access to massive quantities of information is here, complete in form if not in content. The technology has been perfected. Hundreds of data products are available, with many more under development. Vast quantities of information are conveniently accessible by almost anyone. The social, technological and personal implications of the widespread use of CD ROMs are interesting. What happens, for example, when heavy research and self-education become so easy that even the laziest nonreading computer freak can't resist it? As computer use increases, and CD ROM drives become as common as floppy disk drives, will the general education level of the population increase? It's likely that people who haven't cracked a book in years will become knowledge-mavens, given such easy access to information. Will major reference books disappear from libraries as they appear in eminently accessible CD ROM format? I think that CD ROMs will become a fixture in even small-town libraries within a decade. You'll be able to access data in your library via CD ROM, and eventually you'll be able to check out an entire encyclopedia on disk. Continuing with that thought, might books eventually disappear? CD ROM data can, after all, include graphics, and typing a few commands is far easier than searching through the pages of books. If, in 20 years or so, the price of CD ROM drives and disks are so low that CD ROM systems become as common as VCRs (and computers, of course, that trend's already established), publishers may well find the demand for books too low and the cost too high. There's a potential for low-cost dedicated CD ROM systems, too. Books could indeed go the way of the 45-rpm record. When CD ROM systems are generally and inexpensively available, we might see all the really important works published only in CD ROM-form, with shorter works (fiction, mainly) published in book-form. And imagine the trend going full circle, to where owning bound, hardcopy books is a status symbol, with all the expense that implies. But what happens to those who don't have access to information in this new format because of lack of finances or lack of knowledge, or both? Will a kind of "knowledge minority" develop? Will such a minority demand and receive compensatory aid? On another front, we'll probably see all sorts of CD ROM-based businesses popping up overnight. Coin-operated CD ROM libraries. Cottage-industry researchers armed with scores of specialized CD ROM data products, benefiting from the lack of computer sophistication (or economic feasibility) on the part of the vast majority of the business community. That particular market is already being tapped by people with modems, by the way. Or will cheaper CD ROM drives and disks make knowledge so accessible that the paid researcher virtually disappears? Okay, so I've given you a few negatives and a few positives here, and I'm sure that your imagination has been fired to the point where you're ready to buy a CD ROM drive—at least as soon as the cost drops to meet your budget. Now for what to me is the major point of this article: the "Ultimate Temptation." In a word, the ultimate temptation is plagiarism. No, I'm not talking about copying expensive reference works from CD ROM, although this is certain to come up, thanks to the new THOR technology, and to the fact that the data on a CD ROM can, in one way or another be copied to conventional disks. The ultimate temptation is using textual data from reference works on CD ROMs in documents and representing it as one's own work. And, between CD ROM search-and-retrieval software and word processing programs, it can be done. Big deal, you're thinking, so what if a few kids copy part of an article from a CD ROM encyclopedia into a report? Is that such a crime? Kids have been copying passages from encyclopedia articles for years. Well, actually, yes—it is a crime, with the major victim being the person who does the copying, since he/she ends up benefiting less from not writing the report. The kid does not learn. But it's worse than that, because a lot of professional writers are and will be using CD ROMs. Right. Imagine you're a writer with an assignment to write an article about the history of computers. The article is due to be E-mailed to your editor this afternoon—in two hours, to be exact. For whatever reasons, you are just now getting around to writing the article. A CD ROM storage case sits in front of you. In it are disks that contain every reference you could possibly need. Nice. You write the intro, then pop a CD ROM encyclopedia disk in the drive, and do a quick search for articles on the history of computing. It suddenly hits you that you can't possibly do the article in the time available, and everything you need is right in front of you. And you have to get that piece in. As Karl Maiden says in the American Express commercials, "What will you do? What will you do?" The easy way out is to lift the encyclopedia article. And for all too many, it'll be a direct lift—don't even file off the serial numbers and streamline it. Just drop the entire article into the word processor file, reformat it, write a summary, save it and Email it under your byline. Thus you crank out a 4,000-word article in 15 minutes. Nice work if you can get it. And it's work that I fear all too many writers and would-be writers are going to be "getting." It's easy to see how a writer could plagiarize under the pressure of time. And it's equally easy to see how a neophyte writer would be tempted to "borrow" a little professional text to bolster his undeveloped talents. And, yes, it is being done now. Plagiarism is an old and dishonored practice, one that's existed since writing has existed. There are endless well-documented instances of writers with quill pens or typewriters, copying work from existing books and magazines. More recently, it's become far easier to do; dial up an online service, access a magazine's contents, an encyclopedia or a newsletter, and you can easily find an article or an entire book chapter that might be lifted. Fortunately, a minority of writers have access to online services. CD ROMs are, if you'll pardon the expression, another story. They're easier to use than online services, and they are going to be less costly. This means that more information will be available to more writers in a "liftable" format. And, interestingly enough, there are a lot of writers who have, with justification, chosen the ST as the base for their word-processing hardware. And don't forget that the lowest-cost CD ROM drive is made for the ST. Naturally, I'm concerned: I make my living as a writer, and I don't want my work used in any manner without compensation. At the same time, I find myself more than a little disturbed that someone might get away with such a rip-off, and not just because of principles. I possess such hardihood that I would spend the time and effort to write an original piece, and it would gall me to see someone get equal credit (and cash) for taking the easy route. Especially someone who can't write. Of course, if you're not a writer this doesn't affect you—or does it? What if the majority of writers took to merging already published material into their works? In a worst case scenario, such writers might end up with a hold on the majority of the market, thus driving legitimate writers out of the business. And, a couple years on, you, the reader, would find nothing out there but rip-offs and rehashes to read. That's extreme, but it's worth considering. Of course, all writing is derivative to a certain extent, especially nonfiction writing, which is the kind of writing where the ultimate temptation comes into play. All writers depend on printed work for research, and even quotes. And, as my friend Vernor Vinge says, "The lines between simple note taking and quoting and outright plagiarism are very blurred and gray." While we probably won't see the extreme case cited two paragraphs back, I think we're going to see a lot of unoriginal writing on the part of writers as CD ROMs move onto the desktops of writers and students. This implies a lot of unoriginal thinking pipelined through certain media from which most of us currently derive our information. This in turn implies a certain kind of society. Call it a "Frankenstein Complex," or the information revolution backfiring. Call it what you will, but it's a very real possibility. I hope editors pick up on it soon. CD ROM offers more potential than you and I together can imagine. What I've laid out here is merely the tip of the implied informational iceberg, but I hope it's started you thinking about potential for both the good and the bad that CD ROMs offer. We're in for interesting times—perhaps even a renaissance, if we can avoid certain temptations. But technology in general is like that. Again, consider dynamite. This index is an additional service. While every effort is made to provide a complete and accurate listing, the publisher cannot be responsible for inadvertent errors.